Don Wrigley grew concerned when he started suffering from chest pains and shortness of breath whenever he tended to his garden or even walked up his driveway. Testing confirmed the cause: severe aortic stenosis, along with significant coronary artery disease. The Burnaby resident would need a new heart valve. At almost 90 years old, the question became whether open heart surgery was his only option. 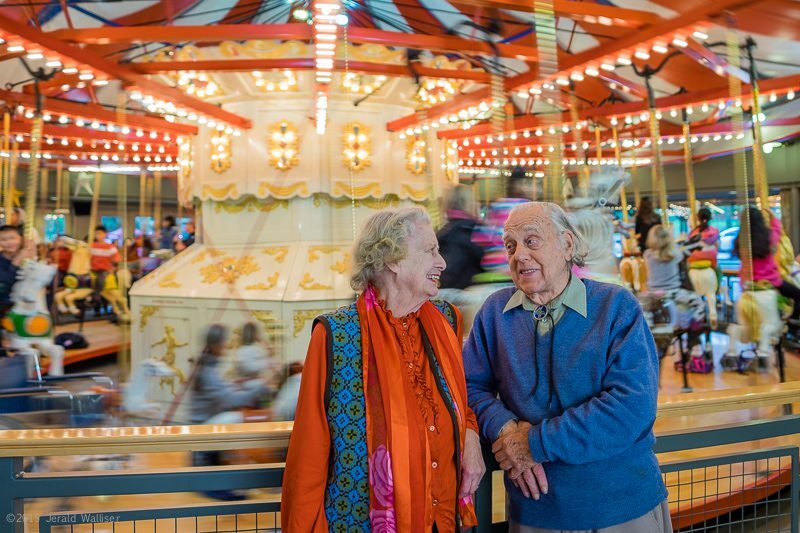 Don Wrigley with his wife Dorothy in front of the carousel that, with his leadership, was acquired, restored, and housed for the City of Burnaby in the early 90s. The pavilion that houses the carousel at Burnaby Village Museum is named in his honour. The usual treatment is open heart surgery to replace the valve with an artificial one. Mr. Wrigley wasn’t keen on the solution. “I didn’t like the sound of that and the recovery involved,” he notes. Dr. Chan is among the physicians who have begun a new approach to valve replacement that avoids the need for a large incision. The minimally-invasive procedure, done at Royal Columbian and only two other hospitals in British Columbia, is known as TAVI or transcatheter aortic valve implantation. Generally, TAVI is reserved for older patients who are high-risk surgically. Younger patients would typically still be offered surgery, since we do not yet know how long a stent valve will last when compared to the surgical valve. But improvements have come with newer generation valves. As knowledge about TAVI grows, technology improves and some of the shortcomings with the early generation devices are overcome, Dr. Chan believes more patients may be considered for the procedure. “It’s less invasive, there’s a much quicker recovery and with a very acceptable complication rate that is comparable to surgery or sometimes even better than surgery,” says Dr. Chan. Mr. Wrigley first had three stents implanted, followed by TAVI at a later date. He and another man from Kelowna shared a piece of Royal Columbian history by becoming the first two patients at the hospital to receive the newer generation Lotus valve.